Wearing a skirt today! I know! So unlike me, right? 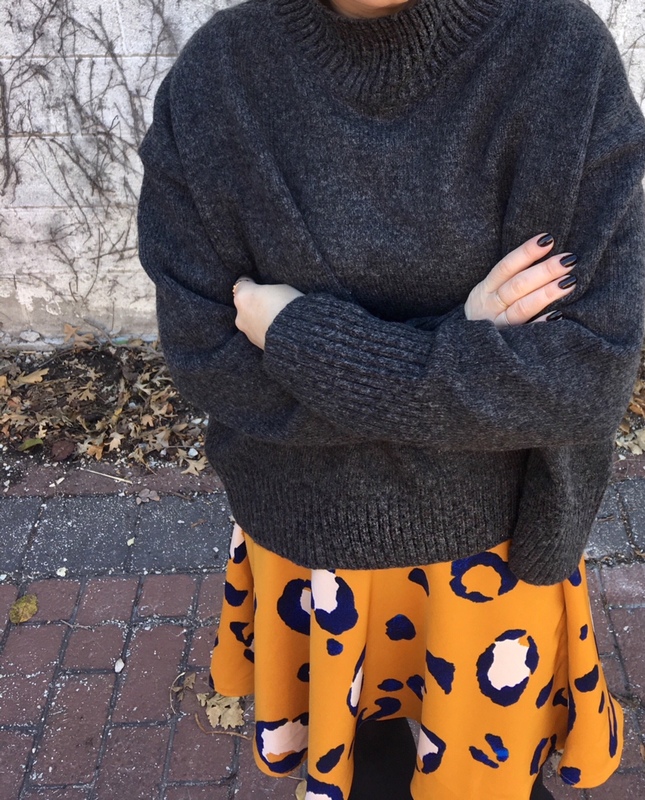 Even though I have a closet full of skirts… But, funny thing is that even a few years back I would ONLY wear skirts to the office (I still think a good pencil skirt is the best skirt style ever!) and when I wore pants on occasion, people actually noticed and commented that ‘Monika is wearing pants today’ haha! Fast forward to today, I am wearing pants to the office 99% of the time ever since a skinny pant that was office appropriate was invented haha. On the weekends I also almost always wear pants (jeans to be exact), but every now and then I’ll remember a particular skirt in my closet and when I dig it up I immediately want to wear it. And the skirt you see today is a good example of that. It is an oldie from a Target x Isaac Mizrahi collaboration way back when. I actually got it on eBay a couple years ago when I saw it on a fellow blogger, and lucky me, eBay had it! Anyways, I love that particular orange/honey color and the oversize leopard print is just too cute! Sooo… this new gray color in my hair will take some serious styling haha… I feel like I need to come up with some updo styles or maybe braiding that will complement it. But for now I am digging this top knot look, which I can finally do because my hair is finally long enough for it. Speaking of hairstyles, I came across this post on blog www.labeaute.org that I really enjoyed. All these hairstyles look so effortless but oh so chic! Wearing: Target x Isaac Mizrahi skirt (very old, similar here); H&M turtleneck; Target footless tights; Target ankle booties (old, an almost identical Target style here). "Holiday gift guide for Her"
I love the oversized leopard print! I also like that it's got special funky colours in it. Very cool. Thank you! That skirt is so special and was so inexpensive, so double bonus!